Some photos from the Dream's full engine rebuild. This stuff works great to seal up old imperfect mating surfaces where even new gaskets fail. Paint the fresh gasket and let it sit for 15min before installing. The One Moto Show is one of the few highlights of the winter season for us northern folk. I'm pretty stoked on this year's show. Here's a shot of us rolling in last February. DREAMONE50: Now Live On BikeEXIF! The DreamONE50 build is now live on BikeEXIF! This marks the first build under my new company, DRAFT Studio. After we wrapped up Maria Papathanasiou hopped on the Dream for a quick impromptu (iPhone) photo shoot. The Golden Hour lighting and vacant industrial district was too much to pass up. COME PARTY: DreamONE50 Unveil, Deus Chicago Romp, Una Maes Party...Motorcycles and Free Drinks. No Brainer. It's going down tomorrow! 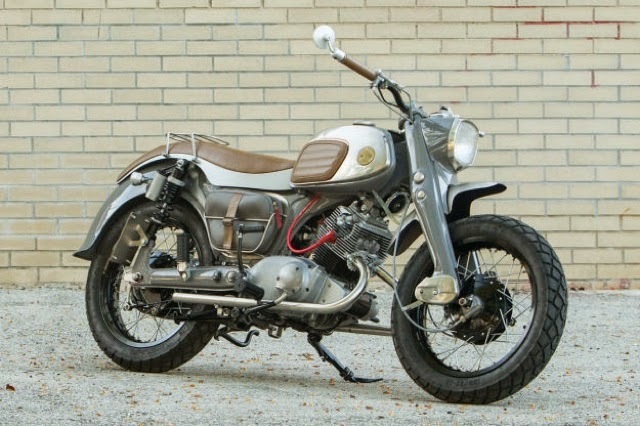 Honda DreamONE50 unveiling, Deus sponsored ride around Chicago, Party at Una Maes with free beer and giveaways! What else do you want? ...for it not to rain? Yea, sure, but Metric Coffee will be there to dole out enough caffeine to make you mentally impervious to sky water so we've got you covered. Come check out the Dream, ride and party with us this Saturday for the Parts & Labor event! All the parts are finally back from plating so we've begun the final assembly on the 1962 Honda Dream 150. Now it's time to dial in the final details. Here are the super rad, super bright, 25 LED Prism Moto Co. tail lights all operational and such. They're 12V units running on a 6V system that previously didn't have turn signals... which took a few trials to get right. They now function as run/stop/turns, are blindingly bright, and were well worth all the effort. Check out the fabrication process here: How To Replicate Exhaust Pipes.